Anopheles (Kerteszia) cruzii is a primary vector of Plasmodium parasites in Brazil’s Atlantic Forest. Adult females of An. cruzii and An. homunculus, which is a secondary malaria vector, are morphologically similar and difficult to distinguish when using external morphological characteristics only. These two species may occur syntopically with An. bellator, which is also a potential vector of Plasmodium species and is morphologically similar to An. cruzii and An. homunculus. Identification of these species based on female specimens is often jeopardised by polymorphisms, overlapping morphological characteristics and damage caused to specimens during collection. 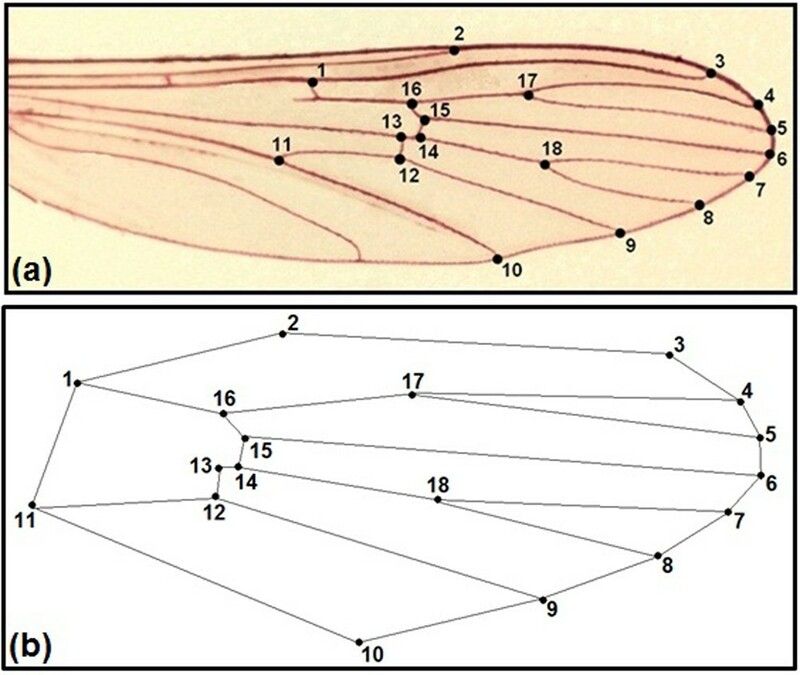 Wing geometric morphometrics has been used to distinguish several insect species; however, this economical and powerful tool has not been applied to Kerteszia species. Our objective was to assess wing geometry to distinguish An. cruzii, An. homunculus and An. bellator. Specimens were collected in an area in the Serra do Mar hotspot biodiversity corridor of the Atlantic Forest biome (Cananeia municipality, State of Sao Paulo, Brazil). The right wings of females of An. cruzii (n= 40), An. homunculus (n= 50) and An. bellator (n= 27) were photographed. 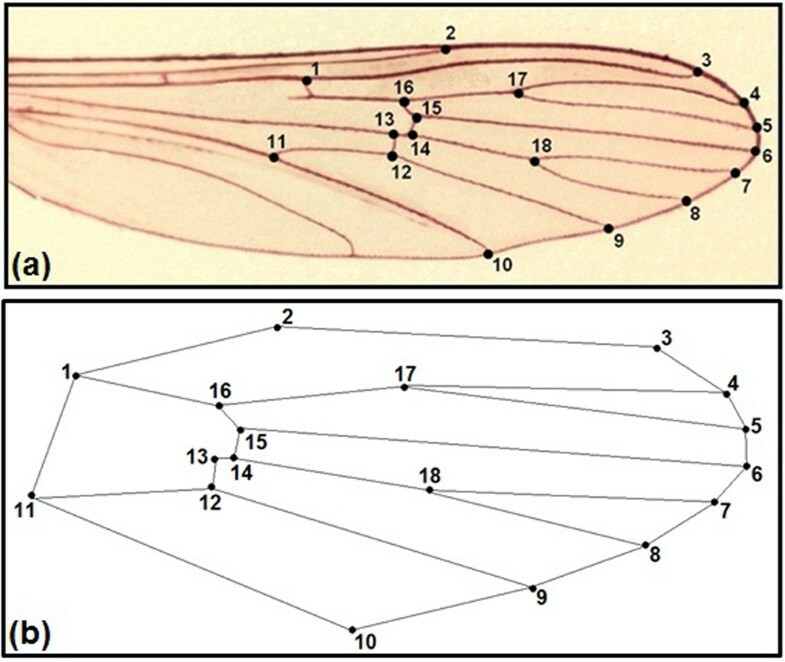 For each individual, 18 wing landmarks were subjected to standard geometric morphometrics. 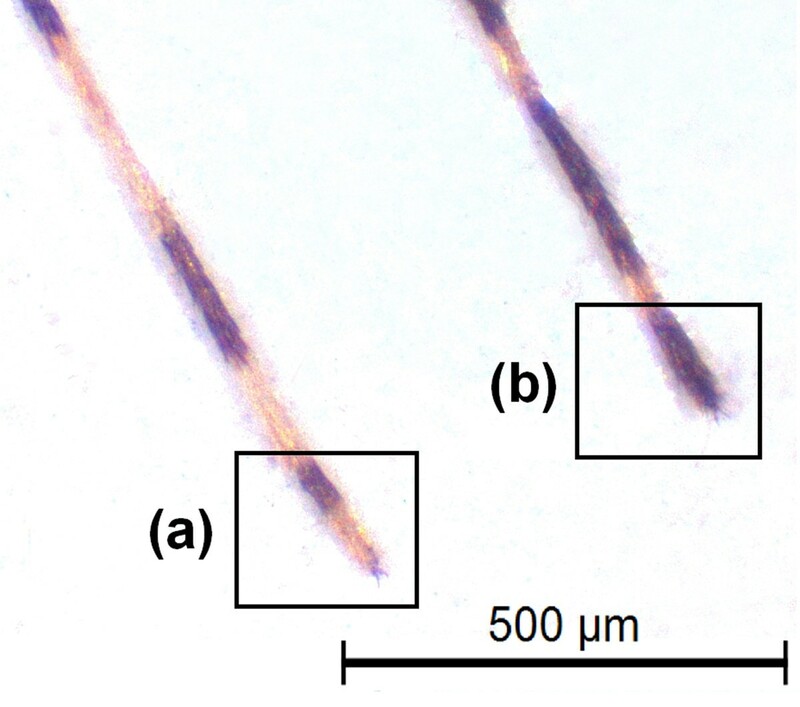 Discriminant analysis of Procrustean coordinates was performed to quantify wing shape variation. Individuals clustered into three distinct groups according to species with a slight overlap between representatives of An. cruzii and An. homunculus. The Mahalanobis distance between An. cruzii and An. homunculus was consistently lower (3.50) than that between An. cruzii and An. bellator (4.58) or An. homunculus and An. bellator (4.32). Pairwise cross-validated reclassification showed that geometric morphometrics is an effective analytical method to distinguish between An. bellator, An. cruzii and An. homunculus with a reliability rate varying between 78-88%. Shape analysis revealed that the wings of An. homunculus are narrower than those of An. cruzii and that An. bellator is different from both of the congeneric species. It is possible to distinguish among the vectors An. cruzii, An. homunculus and An. bellator based on female wing characteristics. The genus Anopheles of the family Culicidae contains species that are widely distributed throughout South America . These species are commonly associated with watercourses and forests, frequently in coastal areas. In Brazil, the primary anopheline species involved in Plasmodium transmission belong to two subgenera, i.e., Nyssorhynchus (Anopheles darlingi, An. aquasalis, An. nuneztovari s.l., An. oswaldoi, An. triannulatus s.l. and species of the An. albitarsis complex) [2, 3] and Kerteszia (An. cruzii, An. bellator and An. homunculus) , with An. cruzii and An. darlingi as the primary vectors of Plasmodium species . The autochthonous transmission of extra-Amazonian malaria occurs mainly in areas of the Southeastern coastal Serra do Mar mountain range, where An. cruzii is a primary vector . Anopheles homunculus and An. bellator are also important secondary vectors of human Plasmodium in that region [7, 8]. In this region, An. bellator, An. cruzii and An. homunculus occur in sympatry and are somewhat morphologically similar. Most Kerteszia species use bromeliad phytothelmata as larval habitats, with the exception of An. bambusicolus, whose habitat is water accumulated inside bamboo internodes . According to Harrison et al., the females of An. cruzii and An. homunculus can be distinguished by the scaling on maxillary palpomeres 3 and 4. In addition, Martins  showed that the integument of the abdominal terga in An. cruzii females are uniformly reddish or reddish with lighter portions, whereas the abdominal integument of An. homunculus are blackish with whitish areas. 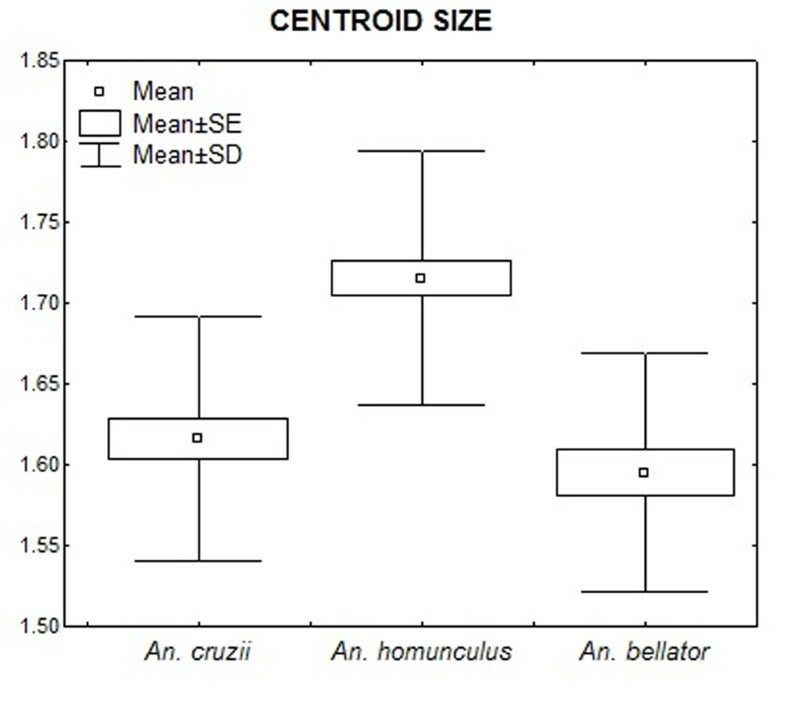 For larval differentiation, Lima  observed that the saddles of segment X are lightly sclerotised in An. cruzii, with either yellowish or reddish integument. By contrast, the larvae of An. homunculus have strongly pigmented saddles of segment X, with dark brown to blackish integument . Anopheles bellator can be distinguished from An. cruzii and An. homunculus by the narrow apical pale bands on hind tarsomeres 2–4 (Figure 1), which are 30% or less of the length of the tarsomeres, and the typically entirely dark colouration of hind tarsomere 5; by contrast, hind tarsomeres 2–5 are 50% basal black and 50% apical pale in An. cruzii and An. homunculus. The morphological identification of these species is often hampered by variability in the diagnostic characteristics and by damage to insect body parts caused by the capture procedure . Morphological differentiation of 5th posterior tarsomere visualized in adults of An. cruzii (a) and An. bellator (b). Recently published literature shows an increasing tendency towards assessing medically important insect species using geometric morphometrics [14–18], an analytical tool that allows for multivariate statistical descriptions of biological structures . In insects, the wings are the main target for morphometrics because of their two-dimensional form and homologous vein patterns. In the present study, we used geometric morphometrics as a complementary and low-cost tool to identify vector species of the subgenus Kerteszia, focusing on three species that occur in areas of the coastal Atlantic Forest. All of the specimens were collected in an area of the Atlantic Forest biome in the municipality of Cananeia, State of São Paulo, Brazil, more specifically in the neighborhood of the Aroeira district (24°53’06” S / 47°51’01” W). Voucher specimens of An. cruzii and An. homunculus were deposited in the Coleção Entomológica de Referência, Faculdade de Saúde Pública, Universidade de São Paulo (FSP-USP), Brazil. Mosquito larvae and pupae were taken from water that had accumulated in bromeliad tanks in 2009 and reared in the laboratory until adult emergence under standard conditions of temperature, food availability and container size. Adult females of An. bellator were captured in July and November 2011 with Shannon traps and preserved in plastic vials with silica gel. Species were identified based on colour pattern of larvae, according to Lima . The right wings of females of An. cruzii (n = 40), An. homunculus (n = 50) and An. bellator (n = 27) were removed from adults and cured before being mounted on microscope slides. The wings were soaked for 12 hours in a 10% potassium hydroxide (KOH) solution at room temperature to remove the wing scales. The potassium hydroxide was removed by washing the wings in a 20% solution of acetic acid. The wings were dyed with acid fuchsin for 60 minutes and then dehydrated in a series of ethanol concentrations ranging from 80% to 98%. Images of the wings were captured using a Leica DFC320 digital camera coupled to a Leica S6 microscope with 40X magnification. Eighteen wing landmarks (Figure 2) of each individual were digitised using the TpsDig software V.1.40 (QSC - James Rohlf), and the coordinate images were plotted onto a Cartesian plane for geometric descriptions. All of the wings were scanned twice, and the repeatability of the digitising procedure was assessed using statistical tests [20, 21]. The wing pictures were deposited in the CLIC Image Bank (http://bioinfo-prod.mpl.ird.fr/morphometrics/clic/declic/list.html). (a) Wing of female Anopheles bellator colored with acid fuchsin showing the 18 landmarks selected for geometric morphometrics. (b) Diagram of immaginary links between landmarks used to depict wing consensus. The wing size was estimated using isometric measurements of the centroid size [15, 22]. Generalised Procrustes analysis was performed to assess the wing shape. To describe the shape variation without the effects of allometry, a regression analysis was performed between the coordinates of the landmarks and the centroid size for each of the three species. Discriminant analysis of the canonical variables was performed. To test the accuracy of species classification yielded by morphometrics, each individual was reclassified by comparing the shape with the overall mean wing size of each species using the Mahalanobis distances. The reclassification was cross-validated and the distances were estimated in discriminant axes in the absence of the individual to be classified. Thin-plate splines were obtained by regression of the canonical scores versus the shape components. The morphometric statistical analyses were conducted with the software TpsUtil 1.29, TpsRelw 1.39 (QSC - James Rohlf), MorphoJ 1.02 and Statistica 7.0. The graphics were generated using Statistica and MorphoJ 1.02. The mean centroid size of An. cruzii was 1.62 mm (range 1.45 - 1.77 mm), that of An. homunculus was 1.71 mm (range 1.60 - 1.93 mm), and that of An. bellator was 1.59 mm (range 1.46 - 1.77 mm). Only the mean centroid size of An. homunculus (Figure 3) was significantly different from those obtained for the other two species (P<0.001; ANOVA + Tukey-Kramer post-hoc test). The allometric effect was low (5.47%) but statistically significant (P<0.0001) and was removed from the shape analyses. A second round of analyses were conducted, with the allometric effect included, however, the results were essentially similar. 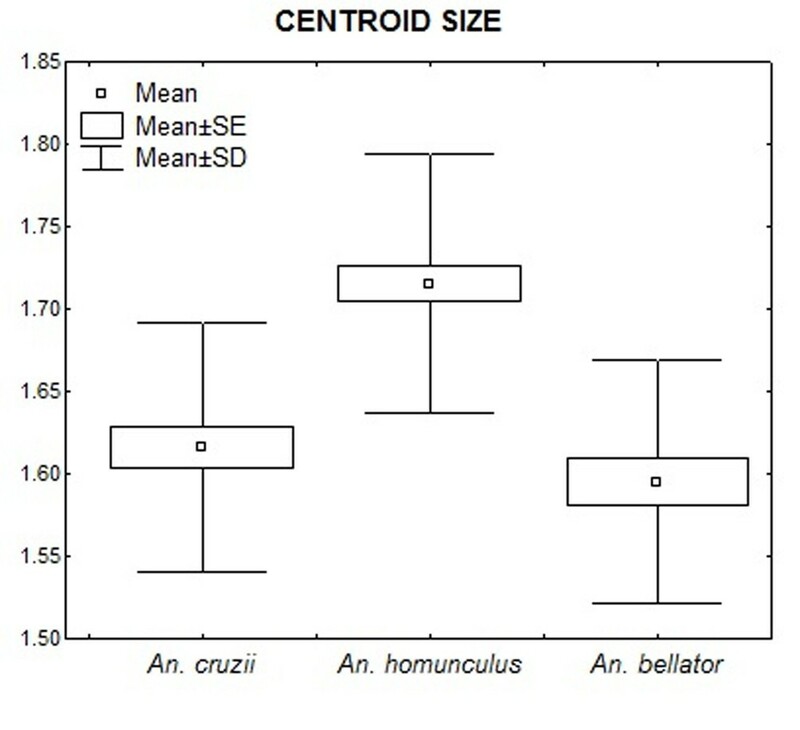 Descriptive statistics of centroid sizes (in mm). The canonical variate analysis for the wing shape showed that individuals clustered into distinct groups in the morphospace according to each species (Figure 4). Anopheles bellator was found to be isolated from the other species, whereas An. cruzii and An. homunculus slightly overlapped. The Procrustes distance between these two species was lower (3.50) than between An. cruzii and An. bellator (4.58) or between An. homunculus and An. bellator (4.32). The accuracy scores after a cross-validated reclassification test ranged from 78% to 88% (Table 1). 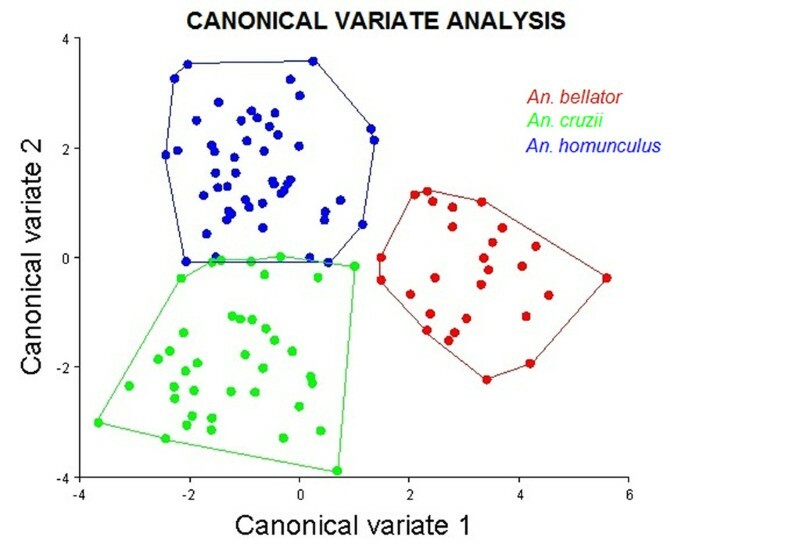 Morphological space of canonical variates resulting from comparison among the three species. 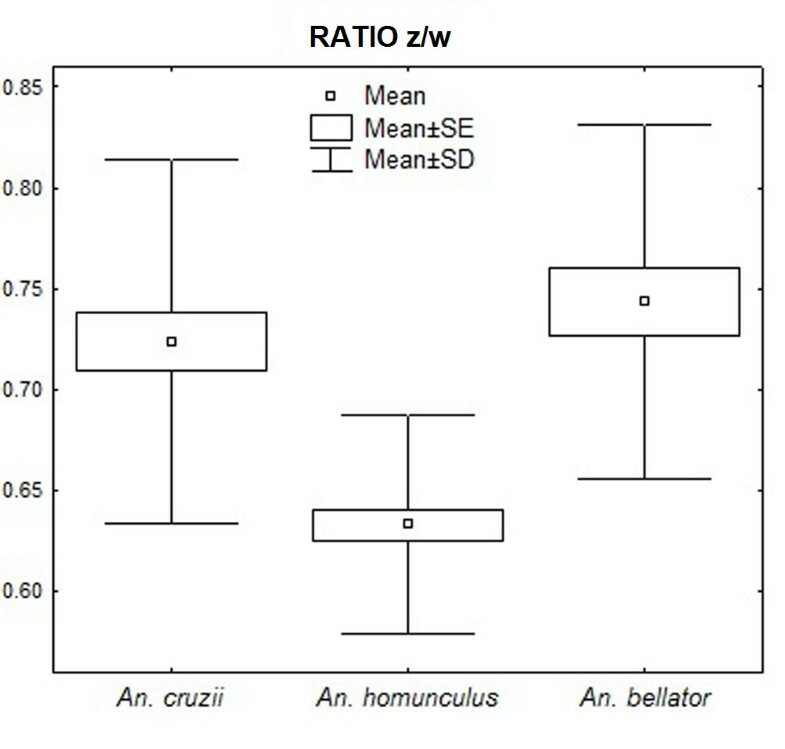 Thin-plate splines with pairwise comparison of species evidenced higher displacement of certain landmarks that were more informative for species identification (Figure 5). The greatest distinction between An. bellator and An. cruzii was found with landmarks 1, 17 and 18, whereas the distinction between An. bellator and An. homunculus was most clear using landmarks 1, 2, 3, 17 and 18. The main shape differences when comparing An. cruzii and An. homunculus were observed in landmarks 1, 2, 3, 12 and 13. Pairwise comparison of thin plate spline between species. Landmarks displacement correspond to extreme of differentiation in each species. (a) An. cruzii (gray) and An. bellator (black); (b) An. bellator (black) and An. homunculus (gray) and (c) An. homunculus (gray) and An. cruzii (black). We noted that distances between some most-influential landmarks were also conspicuously distinct between species: distance between landmarks 13–14 (distance x); 12–13 (distance y); 2–13 (distance z); and 15–18 (distance w). 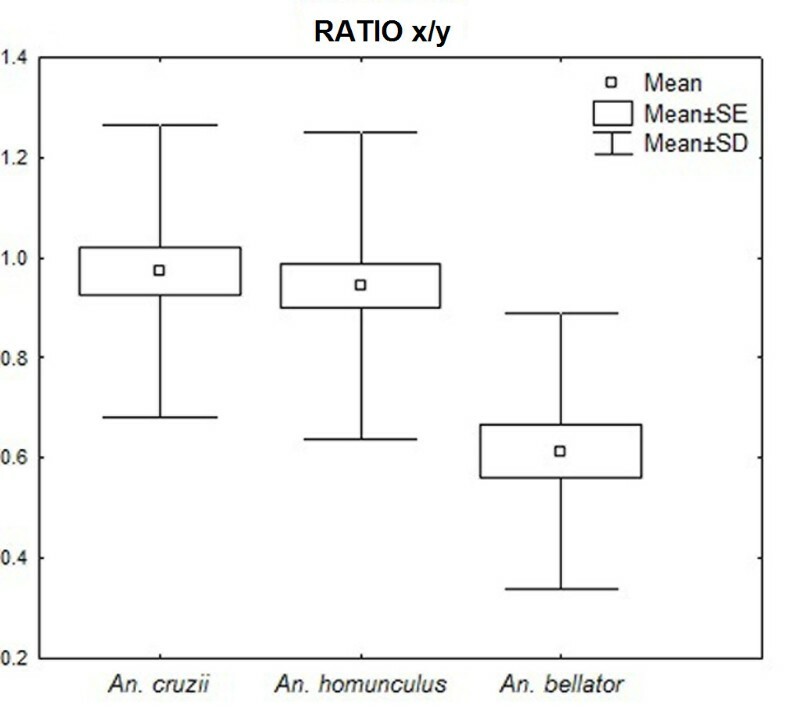 Ratios between those distances are depicted in Figure 6, which allow one to diagnose the species based on a single value. The mean ratio between dimensions x and y was 0.97 for An. cruzii, 0.94 for An. homunculus and 0.61 for An. bellator (Figure 7), with An. bellator being significantly different from the other species (T-test, P<0.0001). The z/w ratio was 0.72 for An. cruzii, 0.74 for An. bellator and 0.63 for An. homunculus, with An. homunculus being significantly different from the other species (T-test, P<0.0001) (Figure 8). Graphical presentation of the distance between landmarks used for ratios x/y and z/w. Descriptive statistics of ratio x/y (in mm). 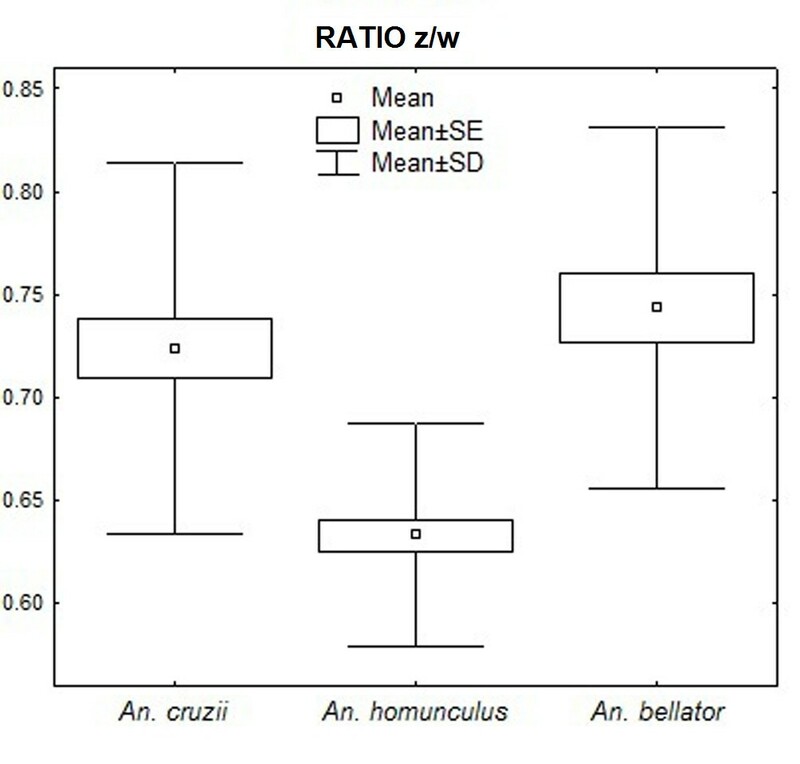 Descriptive statistics of ratio z/w (in mm). Adult females of An. homunculus and An. cruzii are morphologically similar; consequently, distinction between these species is generally problematic when using only the classical morphological characteristics described in identification keys . The correct identification of species is essential for recognition of the vectors involved in the transmission of malaria and for helping researchers to develop control strategies . Geometric morphometrics analyses revealed that An. homunculus, An. cruzii and An. bellator can be distinguished based on wing characteristics. The results of the discriminant analysis showed that An. bellator is well separated from both An. cruzii and An. homunculus in the morphospace of the canonical variables. This finding is consistent with previous results indicating that An. bellator can be easily distinguished by the adult external morphology (hindtarsomere 5). However, one would expect higher phenotypic similarity between An. bellator and An. homunculus if the wing shape is directly associated with the close phylogenetic relationships between the species . An. cruzii and An. homunculus, which are occasionally misidentified , were also discriminated despite partial overlapping in the morphospace of canonical variables. The wing shape divergence among these three species was not as significant as that for species of the genera Culex and Aedes[16, 24], which may be a result of recent diversification of the subgenera  or due to evolutionary constraints. The close evolutionary relationships among Kerteszia representatives might be reflected in the wing shape because of the heritability of this structure, as proposed for other insects . Anopheles bellator and An. homunculus can coexist in bromeliads and compete for resources , and this close association could impose constraints or favour canalisation to the observed phenotype. Considering that the results obtained either with or without allometry were similar, we conclude that size variation did not interfere with species delimitation. Anopheles homunculus had the largest size among species in this study; however, we cannot ascertain that this comparison holds in nature because size is commonly subject to plasticity [15, 24, 26]. At least for An. homunculus and An. cruzii, it is plausible to consider that the size disparity may be associated with genetic determinism because both species were collected in the larval stage and reared to adults in the laboratory under similar environmental conditions and food resource availability. Specimen collections were not simultaneous (years 2009 and 2011), what could lead us to believe that interspecific wing shape divergency may be partly a result of asynchronic sampling and microevolutionary changes. This idea is unlikely because the three-year interval is much shorter than the divergence time among the Anopheles species involved . It has recently been reported that wing shape variation in Aedes albopictus can occur within four years  however, such variation is slight in comparison to macroevolutionary changes. Additionally, phenetic distance between Ae. aegypti and Ae. albopictus based on wing shape remained equivalent over several years . In addition to helping taxonomists identify species, geometric morphometrics maybe used by health professionals to identify species in the future. This technique will not end up with other methods of identification, such as those based on the costal wing spots, but will complement them. Whereas present work was essentially based on wing landmarks, papers from Wilkerson and Peyton (1990)  and Motoki et al. (2009)  successfully used wing spot relative sizes to identify Anopheles species. Although it is not an easy task to simultaneously analyse landmarks and dark spots in Anopheles wings, we hope in a future to combine landmark and spot-based morphometrics, as suggested by Dujardin (personal communication: Jean Pierre Dujardin). The mean ratio of dimensions x and y is 2/3 in An. bellator, whereas this ratio is nearly 1/1 in An. cruzii and An. homunculus. Remarkably, the length of segment 13–14 (distance x) in some individuals of An. bellator is so short that the segment is almost nonexistent. As far as we know, this vein pattern has not been observed in other culicids. Although the occasionally vestigial segment does not directly contribute to the diagnosis proposed here, it may be worth an investigation. As an example, the absence of a wing vein in Drosophila melanogaster was characterised as an informative mutation named crossveinless. Additionally, the mean ratio z/w of An. homunculus was lower than those of the other two species. Accordingly, as shown in Figure 5, the wings of Anopheles homunculus are narrower anteroposteriorly. Apart from the morphological characteristics used in this study, molecular taxonomic markers have been developed for Kerteszia species , facilitating species identification and delimitation. The employment of geometric morphometric methods in taxonomic studies is promising and should be performed in conjunction with other methods to facilitate the correct identification of anopheline species. The results of this study have provided data that will help in the correct identification of Anopheles species. It is possible to distinguish among the vectors An. cruzii, An. homunculus and An. bellator based only on female wing characters. This investigation has financial support from the Fundação de Amparo à Pesquisa do Estado de São Paulo, FAPESP (Grants no. 2011/20397-7; 2005/53973-0), CAPES (Grant no. 23038.005274/2011-24), and CNPq (BPP no. 301666/2011-3 to MAMS). CL is a master recipient of a CNPq scholarship no. 135207/2011-8. The authors declare that they don’t have competing interests. CL, MAMS and LS conceived the study, carried out data analysis and results interpretation. TCM collected data in the field. CL and LS written the manuscript. All authors approved the final version of the manuscript.